I'm at Shmoocon this weekend in Washington, D.C. 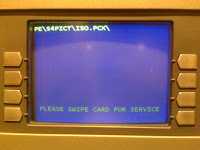 Walking through my hotel last night, I saw the attached image on an ATM machine in the lobby. I waited a few minutes to see if the ATM was simply rebooting...but no, it wasn't.